Last week we brought to your attention a world-class emerging shale play happening in Argentina’s Neuquén Basin. The potential here for unconventional oil & gas development is enormous by any measure. A number of companies are well positioned to grow and prosper, including a few junior companies with significant land holdings. P.S. Neither Michel nor I own shares in any of the securities covered below. Wouldn’t you have liked to invest in the western Canadian sedimentary (WCSB) basin 10 years ago as the new shale plays like the Bakken were being discovered? The global Shale Revolution is not only rushing towards Argentina, it has arrived. The proven unconventional basins here are relatively underexplored and the development of unconventional oil and gas in shales is still in its infancy. Nevertheless, Argentina has a well established oil and gas industry but it pales in comparison to the Canadian oil patch where around 13,000 wells per year are drilled vs. 1,300 wells (100 exploration wells included) in Argentina. There are only a few publicly listed Canadian companies operating in Argentina offering the exposure to an opportunity of a life time. These companies are holding large land blocks that are prospective for unconventional oil and gas development which makes them attractive targets to the majors who are running the show. These juniors are getting courted by the likes of Exxon with farm out arrangements and it wouldn’t be surprising if “forced marriages” ensue as they get taken out one after the other on the back of significant hydrocarbon discoveries further confirming the prolific potential of the shales. Americas Petrogas has a high working interest in about 2.1 million gross acres in Argentina’s prolific Neuquén Basin. This massive acreage is distributed among 16 blocks (14 operated) on both sides of the basin (east and west). The majority of the company’s blocks are offsetting or on trend with major producing oil and gas fields. The company recently farmed out its Los Toldos blocks in the western region of the basin to Exxon Mobil which committed to fund $53.9 million in exploration to earn up to 45% in working interest. The main work will focus on the unconventional Vaca Muerta formation with the 1st well expected to spud in Q4-2011. To date management has identified 165 conventional drilling locations only on 1 of its eastern blocks, the Medanito Sur. The company’s drilling program includes up to 25 wells in 2011 and 2012 targeting both conventional and unconventional plays. BOE will drill 15-20 wells targeting low to medium-risk conventional prospects in eastern Neuquén and 6 or more vertical test wells in the west for unconventional targets. Its production could quickly rise above the 2,000 boe/d level on the back of a successful drilling program over the next 12 months adding significant reserves in the process. In September, Americas Petrogas announced a new oil discovery on its Rinconada Norte block located in the eastern region of the basin (south of the Medanito Sur block) where its first exploration well RN-x1004 flowed at a test rate of 1,023 boe/d (92% of 30 degree API oil). The company will be drilling 2 more exploration wells on this block where it holds a 65% working interest with its partner Gran Tierra Energy holding the rest. Americas Petrogas offers exposure to a large diversified asset base across the Neuquén Basin with multiple proven productive conventional formations and a high leverage to the prospective Vaca Muerta shale. Its massive acreage uniquely positions this junior to benefit from the exploration efforts of many majors ramping up drilling activities all around its blocks. Madalena is another pure play on Argentina’s Neuquén Basin where the company holds 280,000 gross acres in 3 blocks. Madalena’s board is chaired by Ray Smith, CEO of Bellatrix Exploration (TSE:BXE). Coiron Amargo in the eastern region of the basin: 35% WI in 100,000 acres. This block lies in proximity to the Loma De La Lata field which currently produces 15,000 bbl/d of oil and more than 600MMcf/d for YPF. YPF also announced a 150MMBOE discovery at Loma De La Lata following the drilling of 6 Vertical wells targeting the Vaca Muerta Shale. Curamhuele in the western region of the basin: 90% WI in 56,000 acres. Madalena’s block is south of the Filo Morado field (49 MMBOE cumulative production to date with 69 MMBOE EUR) as well as the El Porton field (estimated reserves of 45 MMB of oil and 282 Bcf of gas). Cortadera in the western region of the basin: 40% WI in 124,000 acres. Apache Corp holds 50% WI in this block. Wells in the Sierra Chata field to the east of Cortadera (when fracture stimulated) report average IP rates of up to 8.0 MMcf/d and 10 Bcf per well of reserves. On the Coiron Amargo eastern block, Madalena drilled 5 exploratory wells into the conventional Sierra Blancas formation. Following fracture simulation, the CAS X-1 and CAN X-4 wells IPed at 200 b/d and 650 b/d respectively from the Sierras Blancas formation. The non-conventional Vaca Muerta shale was penetrated by 5 all wells; its thickness is estimated at 350-475 feet. The CAS X-1 naturally flow tested 40 b/d of light oil (32 API) from the lower of the formation. Madalena will be performing a facture simulation program on the Vaca Muerta shale for the first time in Q3 which will shape the work program plans following the results. On September 6, Madalena finished drilling its 1st exploration well CorS X-1 with joint venture partner Apache in the Cortadera block in the western region of the Neuquén basin. This is the deepest well yet to be drilled designed to test the prospective Vaca Muerta Shale formation which was found to be 708 meters (2,323 feet) in gross thickness. The well encountered several formations overlying the Vaca Muerta which were cored as well. Full testing and evaluation of the CorS X-1 is set to commence in October. Positive results will be a huge catalyst to the stock as the encountered thickness is an early indication of the prolific potential of the Vaca Muerta on the western side of the basin. The Curamhuele block (90% WI) just 30 km north of Cortadera will also benefit from the gathered information and results where 2 previously drilled wells will be reviewed for re-entry to test the prospective Vaca Muerta shale formation. Crown Point Ventures has 4 different concessions totaling 288,000 net acres in 2 proven basins: Neuquén and San Jorge. In the San Jorge Basin the company holds between 50%-80% working interest in the 15,000 acre El Valle block. Crown Point is planning to drill 20-25 wells in 2011-2012 targeting oil in up to 4 separate formations reaching an average depth of 1100 meters. So far the company has enjoyed a 100% rate on its first 5 wells with initial production rates ranging from 200 to 600 barrels of oil per day from multiple zones. Prior to year end, the company is planning to drill 2-4 more wells on this concession. In the north western portion of the San Jorge Basin lies the 6,320 acre Cañadon Ramirez block where the company holds 100% working interest. Crown Point plans to drill 2-5 wells on this concession in the next 12 months targeting oil. The block is connected to infrastructure and is adjacent to a producing oil field where the average well recovers about 110,000 barrels of oil. Cerro Los Leones is a large 307,000 acre exploration concession in the Northern portion of the Neuquén Basin where the company holds 49.9% in working interest. This is an oily area surrounded by several producing fields such as Cerro Fortuna (current production 4,675 bod) and Valle de Rio Grande (current production 5,000 bod). This block presents an excellent growth opportunity with low to medium risk for multi-zone exploration and exploitation. Wells in adjacent fields initially produce at 400-800 boe/d with around 750,000 boe in recoverable reserves. The company plans on drilling 2-4 exploration wells by the end of the year following the completion of a 2D and 3D seismic program. Laguna De Piedra is a 247,000 acre exploration block located on the south eastern flank of the Neuquén Basin where the company holds a 50% working interest. In the first half of 2012, Crown Point will be targeting a prospect of 34 million boe, the first of five prospects identified following 3D seismic on 3,100 acres. The drilling will target the Punta Rosada and the Quituco formations. The company is cashed up and targets increasing production from 400 bopd to 5,000-10,000 bopd over the next 3-5 years. While its blocks are considered low risk conventional plays with multi-zone potential, the large 34 million boe prospect at Laguna De Piedra provides a major upside to valuation. 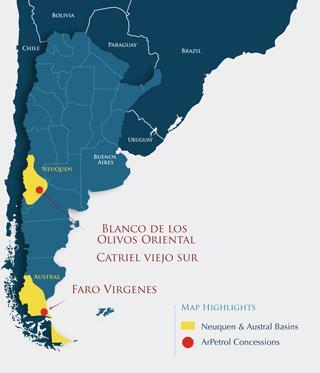 ArPetrol is another junior company focused on Argentina with 2 blocks in the Neuquén Basin and a third large block in the Austral Basin which is the company’s major focus in 2011. In the Neuquén Basin the company has 20% working interest with an opting to increase to 50% in 2 blocks: the 12,355 acre Blanco De Los Olivos Oriental and the 14,000 acre Cartiel Viejo Sur. 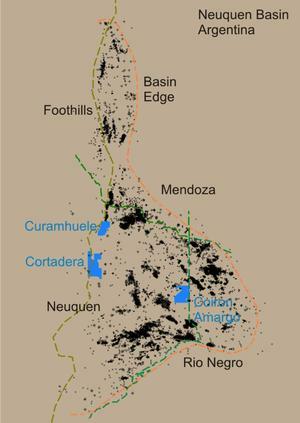 ArPetrol plans on drilling 2-3 shallow wells (1200m) commencing in Q4 2011 targeting conventional multiple zones in Blanco De Los Olivos. While the first block sits outside of the shale oil and gas window, the Cartiel Viejo Sur block lies 60 km NE of YPF’s 150mm boe shale oil discovery at Loma La Lata Field and offers exposure to the Vaca Muerta shale. So far, the company has not announced any drilling plans on the Cartiel Viejo block. In the Austral Basin, the company’s flagship asset is the 100% owned 8.3 million acres (33,600 sq. km) Faro Virgenes block. The Austral accounts for 35% and 20% of Argentina’s natural gas reserves and production and ArPetrol owns its only onshore processing plant (85 MMcf/d capacity). The company recently received approval for inclusion in Argentina’s Gas Plus program allowing it to increase its realized price to $2.47/Mcf up from $1.20/Mcf a year ago. This block offers development and exploration opportunities for years to come thanks to several known pool sizes ranging between 8 and 375MBOE in multiple hydrocarbon charged formations. Faro Virgenes will be the main driver for cash flow growth and with $38 million dollars in hand, the company will be drilling a minimum of 6 natural gas wells (3 low risk development and 3 exploratory) by the end of 2012. Argentina is a hydrocarbon rich country with excellent geology. The few juniors that are focused on this country all share one thing in common: a high impact inventory of prospects that offers significant valuation upside exposure thanks to underdeveloped basins. As realized oil and gas prices improve, the total or partial removal of price caps is another variable that will fuel increased development and exploration. The petroleum industry is well developed with proper infrastructure and a strong internal market. The “Why Argentina?” was easy to answer but the “Now Argentina?” is one question you will have to answer given the global turmoil we are going through and the upcoming presidential elections in October where there is always a risk to the investment climate.